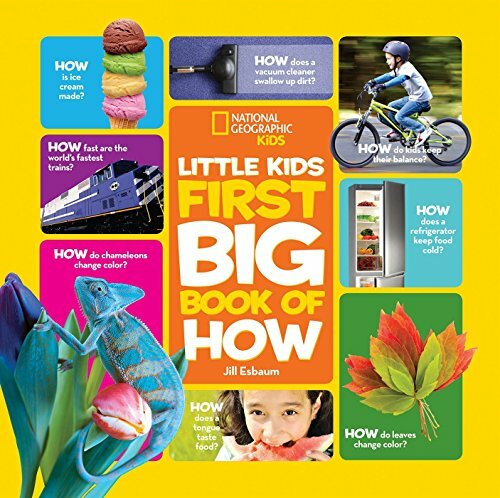 Children ages four to eight naturally ask a lot of “how” questions, and National Geographic Kids Little Kids First Big Book of How by Jill Esbaum attempts to answer every single one of them. It offers focused questions, like how is ice cream made, how the tongue tastes food, and how leaves change colors; and it offers random questions, like how does a refrigerator keep food cool, how fast are the world’s fastest trains, and how does a vacuum cleaner swallow up dirt? If a child can think up a “how” question, this book can answer it. The contents are separated into five categories: Around the Home, which explores the “how” of microwaves, vacuum cleaners, refrigerators and thermostats; Coming and Going, which explores the “how” of changing bicycle gears, how cars are painted, and even how roads are made; My Body, which investigates the “how” of smell, balance, germs, cuts and scrapes, and healing; the Animal Kingdom, which strolls through the “how” of camels staying cool in the desert, chameleons changing colors, beavers building dams, and octopi squirting ink; and The Great Outdoors, which entertains the “how” of tornadoes, hail, how mountains and rocks are formed, and even how the tides change. This book is chock full of some of the best “how” questions a reader has ever asked or been asked, and each fully explained “how” is reinforced with some of the most breathtaking photographs ever. There are pictures of cars being painted, broken legs on the mend, skyscrapers going up, rockets launching, submarines diving, pupils shrinking, and food being grown on farms and then transported to the stores. Learning is reinforced through games like comparing two seemingly identical pictures to find what’s missing, using pictures to tell a story, and keeping tabs on the number of times a refrigerator is opened. Esbaum’s text is funny, educational, and exciting enough to keep children turning those pages until the very end. This book is flexible and diverse enough to be used across multiple genres, including science, social skills courses, math, horticulture, ecology, oceanography, meteorology, or simply as a vibrant independent reading tool.